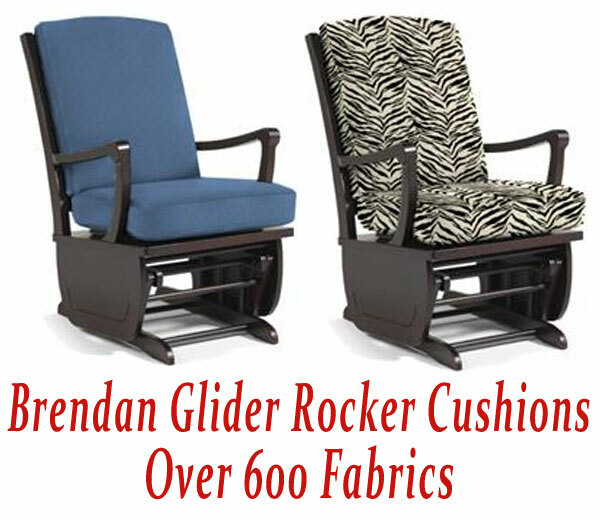 This glider rocker cushion set is a replacement set for the Best Brand Brendan Glider Rocker Chair #C2027. If your glider rocker looks like the chair we have pictured but is not a Best brand chair exactly as above, or you are not sure of the brand do not purchase this cushion set as it may not fit. If you have a Best brand chair, turn the chair up side down and a paper tag should be visible at the bottom of the seat detailing the brand of chair and item number. Please order the correct cushion set. Comes as a set of 2 cushions, back and seat. Back Cushion is made from high loft premium polyester fiber. This cushion set is custom made. DISCLAIMER: This product is for the cushion set only. Chair and Chair Frame are sold seperately. SHIPPING: 95% of orders for this product are shipped within 3-4 weeks plus transit time. This cushion set is custom made. RETURN AND CANCELLATION POLICY FOR GLIDER ROCKER CUSHIONS: Please note that our glide rocker replacement cushions are all custom sewn for you when you order. We do this so we can offer many colors. Cancellation of an order is generally impossible as we start sewing ASAP. We can only accept returns within 30 days of order, a 50% re-stock fee will apply, and the cushions must be in original packaging. Please note that you are responsible for all shipping costs.